Ideal for milling asphalt and concrete surfaces damaged from cracks, frost heaves, and potholes. The high-flow CP18C offers increased cold-planing production, fingertip, electrical control of tilt, depth, and side shift for exact and easy cold-planer positioning. 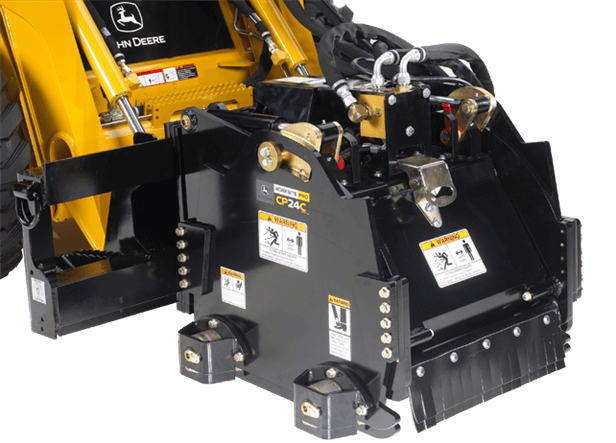 Worksite ProT cold planers are optimized to work with John Deere 300-Series Skid Steers. Plus, they're backed by a one-year warranty and one-of-a-kind parts and service.